Like its predecessor, it is comprised of 14 elements in 12 groups, with three aspherical lenses and two Extra-low Dispersion lenses. Seven blades give the aperture a rounded shape that produces smooth defocus effects in out-of-focus areas when shooting at larger aperture settings. Panasonic said The Lumix G Vario 14-140mm will be available in May for $599.99. Adorama is now accepting pre-orders. NEWARK, N.J. -- Panasonic has announced that it has updated the Lumix G telephoto zoom lens based on the Micro Four Thirds system standard. In addition to the versatile zoom range from wide-angle to telephoto, the new Lumix G Vario 14-140mm / f3.5-5.6 II ASPH. / Power O.I.S. (H-FSA14140) features a splash/dust-resistant* construction for heavy field use yet retains its stylishly compact profile remains lightweight. The practical zoom range of 14-140mm (35mm camera equivalent: 28-280mm) suits a wide range of shooting situations. It can capture dynamic landscapes, bring subjects up close or shoot impressive portraits with beautifully defocused backgrounds. 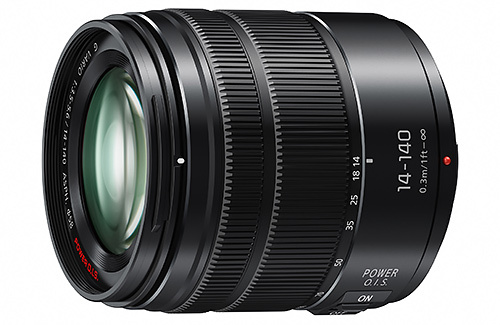 Incorporating an inner focus drive system and stepping motor, the new Lumix G Vario 14-140mm / f3.5-5.6 II ASPH. / Power O.I.S. is capable of smooth, silent operation to work with the camera's high-speed, high-precision contrast AF system for both photo and video recording. It is also compatible with the sensor drive at max.240 fps to take maximum advantage of cameras with high-speed AF. The Lumix G Vario 14-140mm / f3.5-5.6 II ASPH. / Power O.I.S. (H-FSA14140) is built with a highly reliable metal mount and uses multi-coated lens elements that minimize ghosts and flare. Seven blades give the aperture a rounded shape that produces an attractively smooth defocus effect in out-of-focus areas when shooting at larger aperture settings.